Although the Berkeley police did a much better job keeping people safe Sunday than the Charlottesville police did two weeks ago, this is just one of the situations where they were AWOL. Watch the video below as this Trump supporter is being chased out of the park by a group of Antifa terrorists (I refuse to call them anything but terrorists from now on and I hope President Trump does the same). However, forcing the Trump supporter from the area and denying him his First Amendment right to free speech and assembly is not enough. 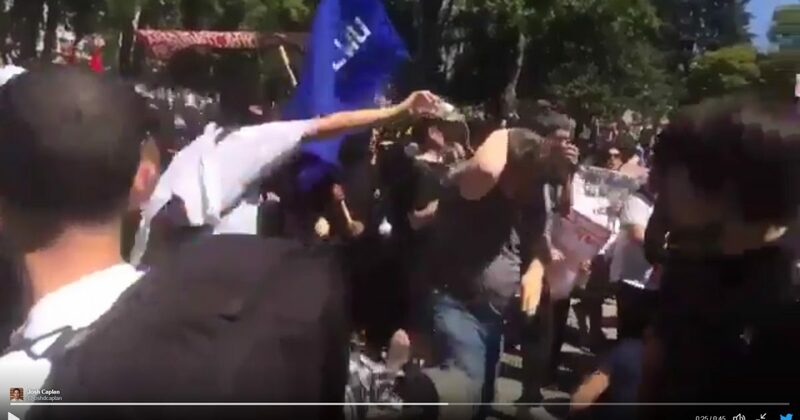 While he is moving away from the gang of Antifa terrorists to safety, they beat him along the way, pouring urine all over him, and pushing him to the ground.